Weekly Meal Plan and Food Preparation | Live. Learn. Love. Eat. I wanted to share a little peak into my meal plan for this week and some of the food prep that I am hoping to get more into the habit of doing. I hope that sharing this will inspire me to be more on top of things and maybe inspire you too. On Sunday I decided to chop up a whole bunch of vegetables to have on-hand and ready to much on. We have been eating veggie wraps with hummus everyday for lunch for the past while and so everyday I am chopping up veggies and grating carrots. I decided that it would be much easier to just prepare a whole bunch at once and have them stored in containers in the fridge ready for when I need them. 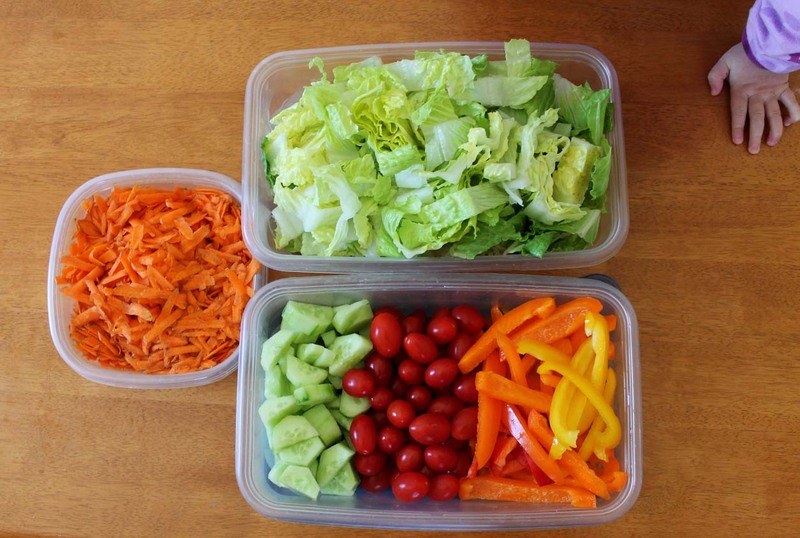 I used to be more on top of things like this, but I will admit, I have gotten rather lazy about food prep lately. I still seem to keep the baking stocked in the freezer, but the fresh stuff, I have been forgetting to have prepared. The funny thing is (and I swear by this) that whenever you have fruit or veggies cut up, they will get eaten! It seems that I couldn’t cut up the vegetables fast enough! 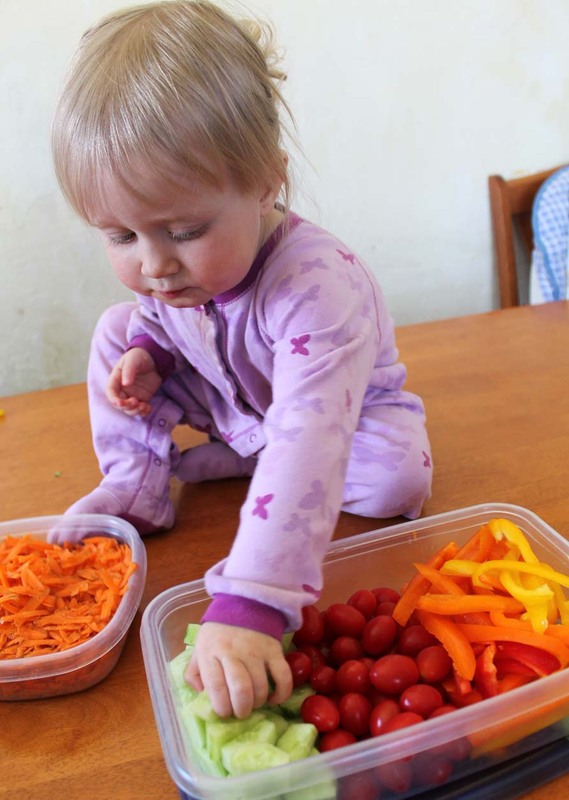 Serafina was right there eating up all the cucumbers (her favorite) and tasting the peppers, tomatoes and carrots. So of course, I had to take pictures of her munching away. 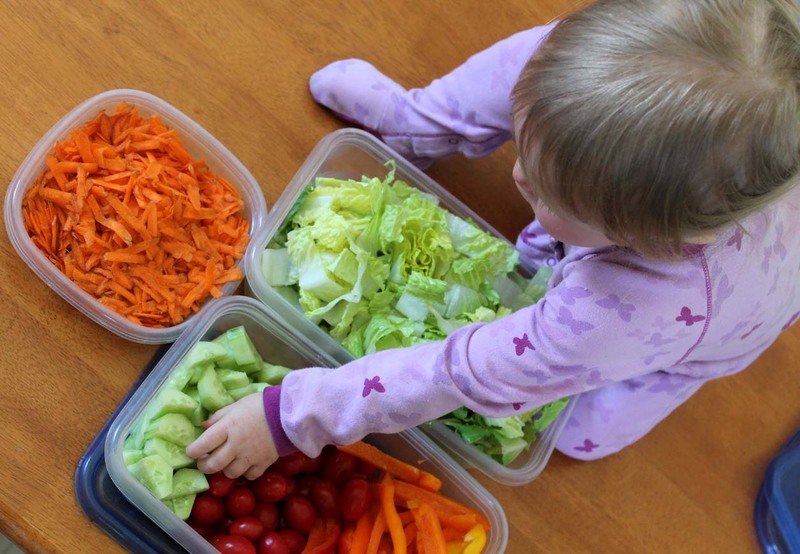 This little munching baby has inspired me to keep up the habit of having veggies cut up and ready to go at all times! I know I am a day behind on this, since it is already Tuesday, but here is my rough meal plan for the week, as well as the food preparation that I plan on doing each day. I already made my Tomato Cabbage Vegetable Soup and Quick-Rise Whole Wheat Bread yesterday for lunch and so today’s dinner is taken care of. Breakfast – Cereal and unsweetened almond milk with banana. Wheat puffs, panda puffs or rice crispies. Lunch – Ezekiel wraps with fresh veggies and hummus. Snack Options – apples, unsweetened applesauce, fruitsource bars, whole wheat crackers, nuts, almond carob chip cookies, trail mix cookies or banana bread. The girls like to snack on a variety of things, these are usually the options. Breakfast – Cereal with almond milk and banana. Snack Options- apples, unsweetened applesauce, fruitsource bars, nuts, whole wheat crackers, almond carob chip cookies or trail mix cookies. *Food prep to be done – make muffins, either carrot walnut or raisin bran, likely both. Snack – Cereal and almond milk with banana. 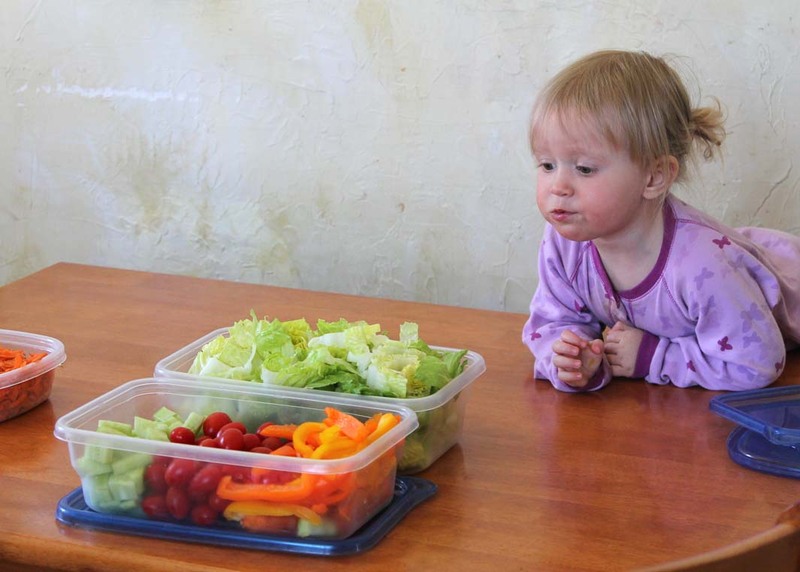 Snack – Fruit, oatmeal, cereal, muffins or whatever else the kids want to have. 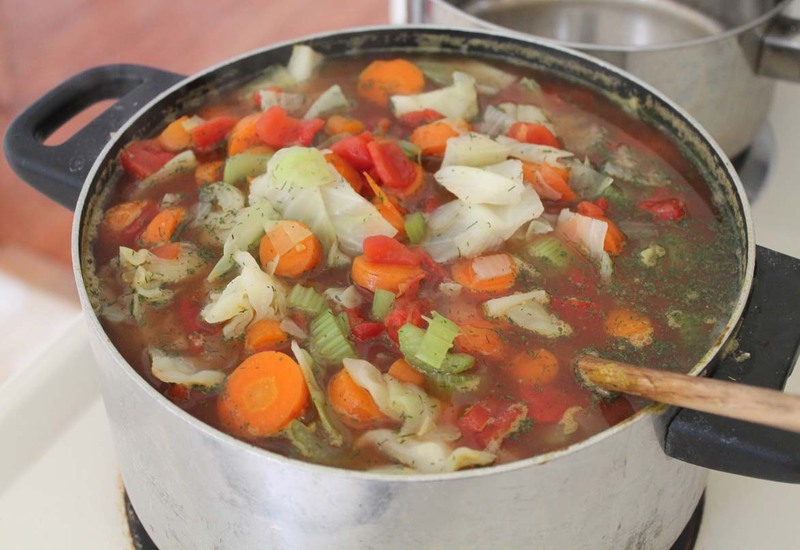 * Food prep for the day – make soup and quick bread in the a.m. Bake more cookies in the afternoon. Breakfast – Cereal, oatmeal or muffins with fruit. Snack – Cereal, oatmeal or muffins with fruit. Snack – Cereal or oatmeal with fruit. * Food prep for the day – Make pasta lunch. Make pea soup in the afternoon. Let me know if this has helped you at all or if you have any questions or anything to share, please do below! It is helpful to see you doing this. It’s the hardest part! Your plan looks great! We had hummus veggie wraps for lunch today too! Hi Tiff, recently stumbled upon your blog and have spent every spare moment since, reading it and checking out all your awesome recipes. I absolutley love them all, and have been baking like mad the last few weeks, and found my self a great new hobby!! I always do weekly meal plans, and this week, its all with your recipes, it was so nice to bypass the meat section yesterday while grocery shopping, alot cheaper too!! So thankyou so much for the recipes you share, the inspiration, and the beautiful spirit that beams out from all your writting. Thanks so much for your comment Cody! 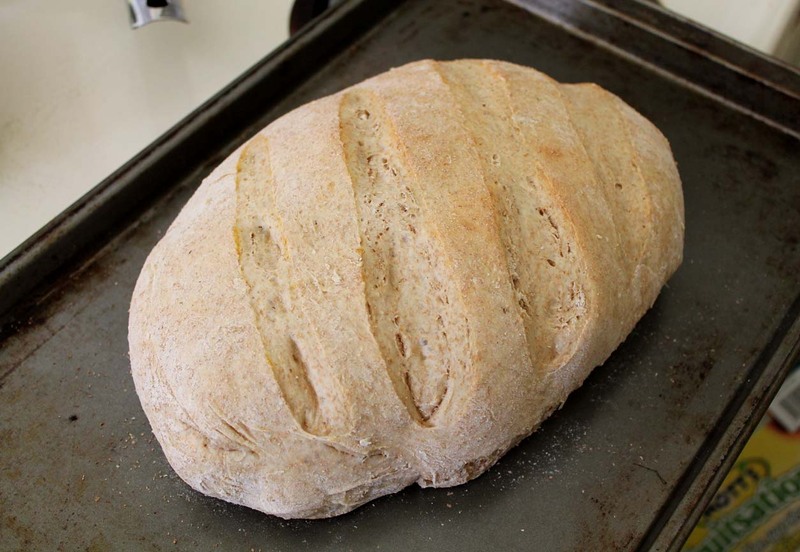 I am glad to hear that you enjoy so many of the recipes that you find here. We are fortunate to live in Canada. The maple syrup that I get here is $12.69 for a 1 liter jug and that lasts me for about 5-8 recipes, depending on what I am baking. That is just available at our supermarket. I know that it is obviously much cheaper here than in other countries. If brown rice syrup is working for you, that is great too. Another option (although not considered vegan) is honey. I don’t know if that is any cheaper, but I know some of my friends who do a lot of baking for their families use honey as another healthy alternative to sugar. I am not totally against honey, even though I am vegan. I think honey is a very healthful food.